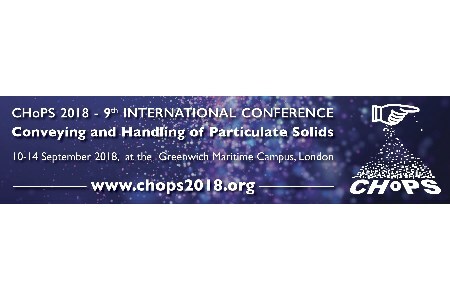 CHoPS, one of the largest international conferences devoted to all aspects of particulate solids technology, will be held at Greenwich Maritime Campus in London in 2018. Mechanical behaviour of bulk materials. Industrial applications in the form of end user case studies. Abstract submissions will be accepted from January 2017. CHoPS will once again be the forum for the greatest minds in this area of science and industry. Industry-specific and application-oriented contributions are especially welcome covering all scales of particulate processing. CHoPS will be held under the chairmanship of the distinguished bulk solids handling expert Prof. Mike Bradley, Director of The Wolfson Centre for Bulk Solids Handling Technology, U.K. He is Chair of Solids Handling and Processing Association (SHAPA, the official trade body for the solids handling equipment industry), Fellow of the Materials Handling Engineers Association (MHEA), member of the Bulk Materials Handling Committee of the Institution of Mechanical Engineers and the international scientific council of the triennial International Conference on Conveying and Handling of Particulate Solids. CHoPS is organised by The Wolfson Centre for Bulk Solids Handling Technology and supported by SHAPA, IMechE, IChemE, MHEA, EFCE and many other associations. The last CHoPS Conference in 2015 brought together more than 200 particulate solids specialists and well-known scientists and engineers from all over the world – with an international attendance of 80 percent. Established in 1995, CHoPS is one of the longest-running conferences on particulate solids anywhere in the world.